Oregano is a perennial herb that is exceptionally easy to grow and thrives under the same conditions that thyme can be found growing in. When growing oregano inside, you can use 6" pots, where it will assume more of a trailing aspect than is often found on outdoor plants. Also like thyme, oregano is an excellent plant for hot, dry and sunny places, which means it will frequently thrive indoors given enough light. 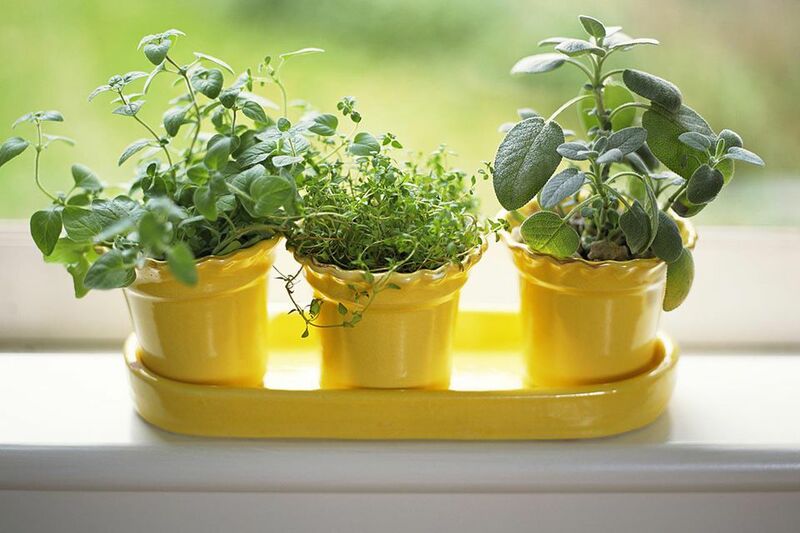 Regularly pinching off leaves will encourage the plant to be bushier and increase your harvest and even a single pot will provide you with more oregano than one household can reasonably use. Healthy oregano is a rapid grower and will quickly fill the pot. In general, it's a good idea to cut the plant back once it begins to become unruly, which should also reduce the need for repotting. Also in general, don't repot indoor herbs (even perennials). Instead, use them for a few months, then replace the plant when the initial soil begins to show signs of exhaustion, usually after about six months. Ideally, repot oregano just once: from the initial nursery pot (usually 4" plastic pot) into a 6" clay pot when it comes home. There are actually several plants called oregano, including a few that aren't even related. Typical garden oregano is the Origanum vulgare. Along with marjoram, it's a member of the mint family (a particularly delicious family of plants). This plant features purple flowers and is considered a weaker tasting oregano than some of the traditional cultivars, which include Turkish oregano (O. onites) and Italian oregano (O. heracleoticum). Numerous other cultvars are also available, with tastes ranging from mild to rather spicy and strong. Organo/marjoram hybrids are also marketed. Finally, the plant frequently sold as Mexican oregano is actually not an oregano at all but related to the verbana plants. Oregano is a great starter herb because it's easy to grow and tends to yield very well. People used to the dried oregano in bottles will likely be surprised by the sharp flavors of fresh oregano—it has a wonderful flavor that seems only barely related to the dried supermarket product. Nevertheless, oregano is an ancient medicinal plant and its use as a therapeutic agent goes back centuries, where it was used for gastrointestinal and respiratory problems. Oregano can also be dried easily and stored or used to create highly flavored oregano oil.